October has been a busy month at Saint Joseph’s Episcopal School! We finally feel like we’ve hit our 2017-2018 stride. Every day is full of learning, fun, laughter, and fellowship. I am extremely grateful for this place, for the amazing faculty/staff, for our families and students, and for the opportunities to gather together—whether it be during our worship services or at our annual events like the Back to School BBQ and Trunk or Treat! Speaking of the Back to School BBQ, what a wonderful evening that was! Thankfully, the weather held up and allowed us to enjoy our new playground. Special thanks to Mayor Steven Grant and Joey, the Jaguar for making appearances at our ribbon cutting ceremony. It was a nice celebration of the time, hard work, and dedication our phenomenal Playground Committee and Parent Organization put into this endeavor. I love driving on campus and seeing our students enjoying this much-needed addition to our campus! As for the BBQ itself, I am eternally grateful to our Development Team (Kelly DuBois, Janet Sanchez, and Rhiannon Aubrey) for putting the event together. Very, very special thanks to the volunteers who helped serve food, tend bar, clean-up, and cook: Audra Agramonte, Cary Braswell, Robby DuBois, John and Gina Czulada, Marsha Farmer, Joe Ilcus, Gina Lambert, Misty Louthan, Rick Nevad, Kelly Raimonda, Aden Reese, Colette Turner, Brian and Jaime Veccia, and Vanessa Wilson. And, a special shout out must go to Randy and Philomena Smith for graciously supplying the food! I hope you received the beautiful Jaguar Fund brochure in the mail by now. (If you haven’t, please let me know.) This is one of our most important initiatives each year, as monies raised help bridge the gap between tuition and expenses. We have been blessed to also utilize Jaguar Fund contributions to enhance our campuses in a variety of ways, which are listed in the brochure. This year, I’m excited about launching The 1958 Society for those who give at the Founders Circle—$1,958 and above. A portion of the donations at this level will be used to start a five-year Endowment in honor of our sixtieth year! At the Early Childhood Academy, we recently celebrated Lady I Love Night, a night to honor the special women in our students’ lives. What a lovely event! The ECA’s yearly Pumpkin Silent Auction also took place this month--earning $185 toward Jaguar Fund. It’s a treat to see our teachers’ and students’ artistic talents come to life. And, the pumpkins are wonderful keepsakes; I still have one from when my son, Keaton, went to the ECA! As we approach November, please be mindful of the following: First Grade students honor the saints during our annual All Saints’ Eucharist on Wednesday, November 1st; St. Francis Awards will be given to nominated students on Friday, November 3rd; Daylight Savings Time ends on Sunday, November 5th; we will celebrate a Thanksgiving Eucharist on Wednesday, November 15th; and, our week-long Thanksgiving Break occurs from Monday, November 20th, through Friday, November 24th. Thank you for your vital part in the mission of Saint Joseph’s Episcopal School through your prayers, financial gifts, and advocacy. For those of you who are not on campus every day, you are always welcome to see firsthand all of the good that is happening in the lives of our students because of your support! As always, if you have any questions, comments, or concerns, please reach out to the Office, to specific faculty/staff members, and/or to me directly. One of the staples at Saint Joseph’s Episcopal School is our Middle School Retreats. Students in Grades Six through Eight take part in teambuilding activities, community service, off-campus fun, and much more! These Retreats fall under our STREAM philosophy because of the skills and practices students obtain—most unbeknownst to them! Our Eighth Graders partook in outdoor activities and teambuilding exercises with Pastor Lynne and Mr. Wideroff at the annual Pathfinder Retreat. Seventh Graders worked together to try to beat the clock in an Escape Room and in several teambuilding exercises on campus. Sixth Graders navigated their way through Magic Kingdom and participated in activities at school, as well. Each class took part in decision making while honing communication skills, providing support to classmates, and exploring their problem-solving skills. These Retreats allow our students to learn something worthwhile about one another, and they were able to recognize their strengths and areas for personal improvement. Retreats also incorporate educational aspects and community service. This year, Sixth and Seventh Grades cleaned and learned about the Scrub area across the street from SJES! In other STREAM news, almost all of our students (from PK through Eighth Grade) have visited and/or gone through Orientation in our new SmartLab! I have received wonderful feedback from our students and teachers about this state-of-the-art classroom, which is only one of two in the state of Florida--and the only SmartLab in the United States that has curriculum for all grade levels. 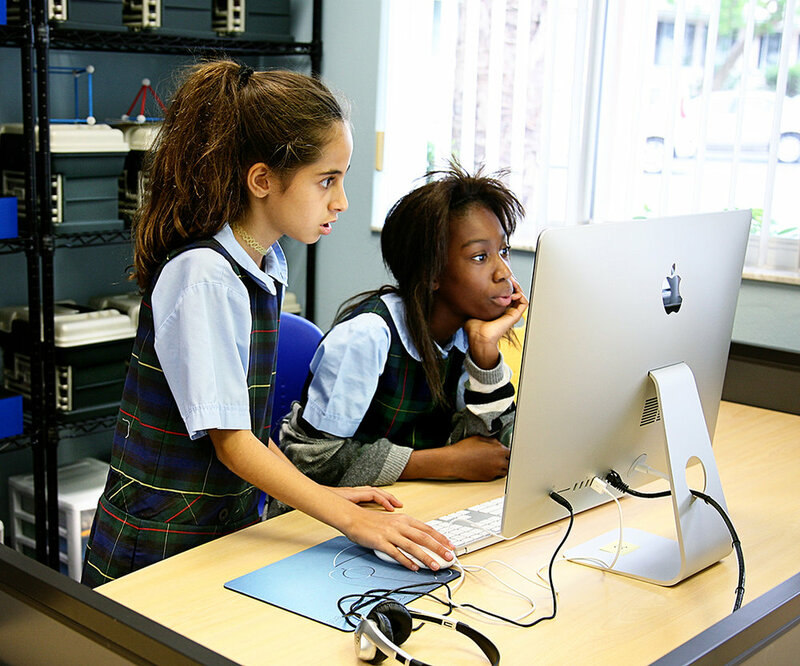 (Most SmartLabs center on just elementary-aged or middle school-aged students.) We can’t wait to showcase it in a future Technology Night in the spring. Stay tuned! Browse our virtual directory of businesses owned and operated by School families, Church parishioners, and Alumni!